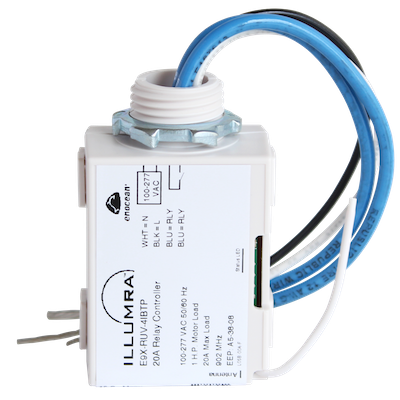 The ILLUMRA 20A On/Off Area Controller switches full circuit 20 amp loads on command from wireless switches, sensors, and central controllers to facilitate the reduction of energy consumption and support compliance with the latest energy regulations. The device delivers long-life reliable high-current switching using solid-state arc suppression technology to eliminate arcing during switching of the mechanical relay contacts. Wireless functionality reduces the installation time and expense by eliminating wiring to switches and sensors. Use for automatic control of LED lighting, plug loads, motors, etc, in applications where the expense or disruption of pulling new wires would be prohibitive.